I just want you all to know how much I love these cookies. 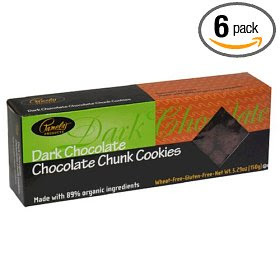 Pamela's Gluten-Free Dark Chocolate Chunk Cookies, made with 89% organic ingredients. Pair these with some lactose free milk and I'm in heaven. Tonight I decided to go a little crazy and make a fancy dinner for myself. I had some steak tips defrosted and I didn't know what to do with them so instead of finding a good recipe, I made up my own. I made a box of GF thai rice mix and then in a skillet I heated up some fresh ginger and garlic in some extra virgin olive oil, then I added mushrooms and green onions. I added some red wine vinegar at the end, but didn't really cook it well enough to reduce it. I broiled the steak tips. It wasn't at all a bad meal but could've used a few improvements. I'm not a fan of the thai rice, it's actually kind of bland for what's supposed to be a sweet chili curry. Well, it was a fun experiment and I think next time I'll try a recipe instead of just winging it. I wish my kitchen was bigger, I love to cook but I hate my kitchen. There is about a 12"x12" square of counter space. Only 2 and a half days left until my follow up with The Doc. I can't wait. Then it's the long weekend and thus begins my birthday celebrations. Maybe I should find a good gluten free cake mix so I can have cake on my birthday and not worry about it making me sick. That would be fun. You know what I really need? A kitchen-aid mixer! I finally got a food processor about a month ago and although I haven't used it very much I do love it. I plan on using it this weekend to make some salsa. YUM.